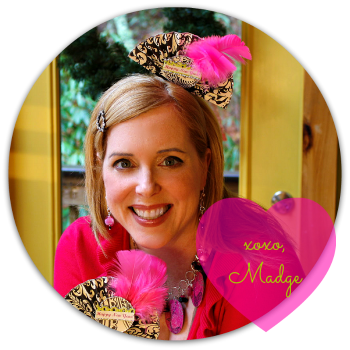 Retrofabulous Christmas Craftabration with Madge! Final Project 2009! I hope to start this retrofabulosity earlier next year. There are just far too many good ideas in these magazines to waste! Until then...here’s my final Retrofabulous holiday idea for 2009. I collect vintage mercury glass ornaments and kitschy holiday decorations and I love the elaborate wreaths people make by hot gluing a ton of them on a Styrofoam or wire wreath base. They go for big bucks on eBay. 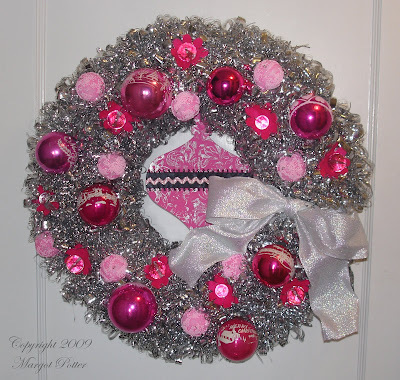 (Check out this fabulous vintage ornament packed wreath from Junkhound Sally!) 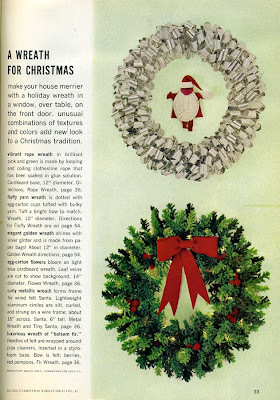 I personally don’t want to trap vintage goodies into a wreath forever. They’ve survived this long unscathed! I scored four tinsel garlands on super clearance after last Christmas with this project in mind. Flash forward a year...a trip to the craft store for a Styrofoam wreath and some Styrofoam balls and a gathering of pretty pink ornaments...and SHAZAM! This wreath kicks some serious tinsel! 1. Paint the chipboard ornament pink. Allow to dry. 2. Stamp with layers of floral vines in silver. Allow to dry. 3. Glue a stripe of black satin ribbon across center front of ornament. Glue a rick rack trim stripe in the center of the black satin stripe. 4. Cover small foam balls with a thin layer of Floam and quickly remove various segments creating a textured effect. Allow balls to dry overnight on a non-stick craft sheet. 5. Use Big Shot to cut out felt flowers. 7. Wrap tinsel around wreath, securing ends with 2-shaped wire segments as you work your way around. Wrap so there are no foam gaps. When you reach the final wrap, tuck that under with another u-shaped wire segment and clip off excess garland. 9. 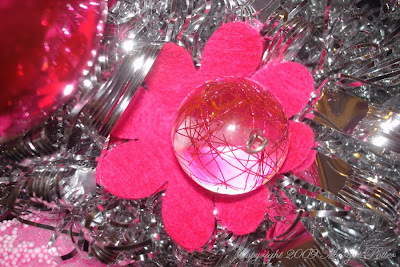 Use looped end 5" wires to slide in your beads and flowers; they should be at the same spot as your foam balls but on the opposite side of the width of the wreath. 10. 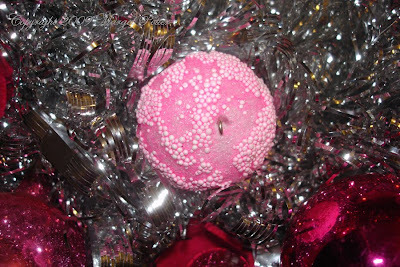 Use u-shaped wires to attach the ornaments to the wreath, in between the foam balls. Leave one area open for your ribbon. 11. Cut off a long section of ribbon and wrap around wreath in open area. Tie into a bow. Cut off any excess ribbon. 12. 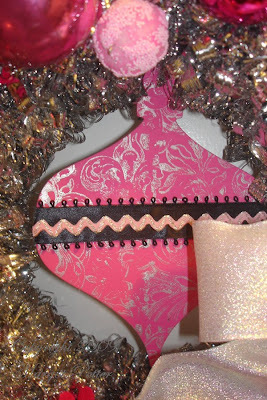 Hang your chipboard ornament on wired tinsel from the top center of the wreath so it hangs inside. wonderful - i love the pink! hope you have a wonderful holidays and i truly enjoy following your blog! Check the copyright area on the masthead for a date, as that might be the only place you'll find one. Those used to live in my office "back in the day"--I had a huge set of back issues! LOVE the wreath!! Fabulous! I love vintage ornaments and what you did with them, the wreath, and the garland is OUTSTANDING! Jodi thank you. It means so much to me to have such wonderful and creative readers. That has some serious fun quotient. 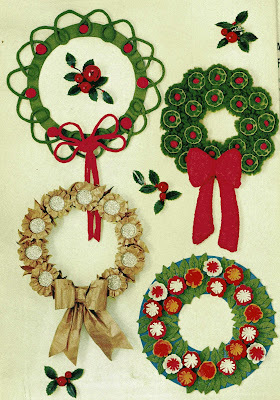 Remind me to share with you the retrofab package wreaths that my craft Aunt Charlotte made in the 70s...and I continued from the first one I made for my 7th grade teacher up until a few years ago. Not one is the same and I wrapped thousands of raisin and paper clip boxes. Early on, before the invention of glue sticks, they were all constructed by HAND SEWING them to stryofoam bases, using hat pins and white craft glue to stabilize them. Today they are much quicker and no less kitschy! But my husband made me throw out my Sterilite container filled with little boxes that I would collect throughout the years, so alas, it will be a long time before I craft one of those puppies... and come to think of it, I never actually made one for myself! Sheesh! Merriest of Christmases to the Potters! I'm a big fan of retro crafts and vintage crafty mags. 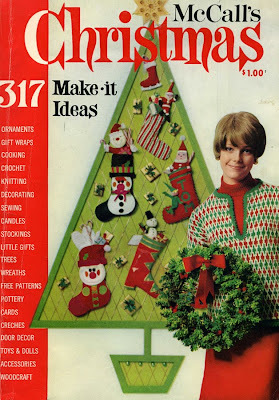 My plan was to do a few retro x-mas craft projects this year but just never got around to it. Well, there's always next x-mas...Love this wreath! Those sound fabulous! What is it with husbands throwing stuff away?! Sheesh. Happiest of holidays to you and to yours. The holidays get away from us, don't they? I was hoping to get more posts done with this theme, but the straw pile got the best of me. Cool! I agree on the soft tinsel. I especially like what you did with the chipboard ornament. What is Floam? Looks like spray on foam but with white beads like snow? Floam is slime with polystyrene balls in it. It dries hard, but can be reactivated with water, so if you use it to craft you seal it with a varnish or paint. I had to sell it on QVC and make samples, so I came up with some mixed media applications.